What better way to reign in the new year than with some fresh new ideas for appetizers! This bite-sized party food will impress and fulfill the hunger of all your pumped-up party-goers as they wait for the great ball drop. With an adorable presentation and an almost universal food favorite, these meatballs a la fork are a sure hit at your New Years bash. Place the ground meats, bread crumbs, parsley, Parmesan, salt, pepper, nutmeg, egg and 3/4 cup warm water in a bowl. Combine very lightly with fork. With your hands, form the meat into 1-inch balls and set aside. Pour half vegetable and half olive oil into a large 12-inch skillet over medium heat. Once the oil is heated, reduce to medium-low heat and add meatballs in batches. Dont crowd the meatballs as you sear and make sure to brown them on all sides. Each batch should take around 5 minutes. Move the meatballs to a plate covered with paper towels to dry. Once you are done searing all the meatballs, remove the oil from the pan but do not wash it. Heat olive oil in the same pan and begin to sautee your onion over medium heat. After 5 to 10 minutes, your onions will become translucent, then you may add the garlic and cook for one more minute. Add the wine and raise heat to high, scraping any bits from the pan until almost all the liquid evaporated, about 3 minutes. Stir in your chopped tomatoes, parsley, salt and pepper. Return the meatballs to the sauce, add the basil and cover; let simmer over lowest heat for 20 minutes, or until the meatballs are cooked through. 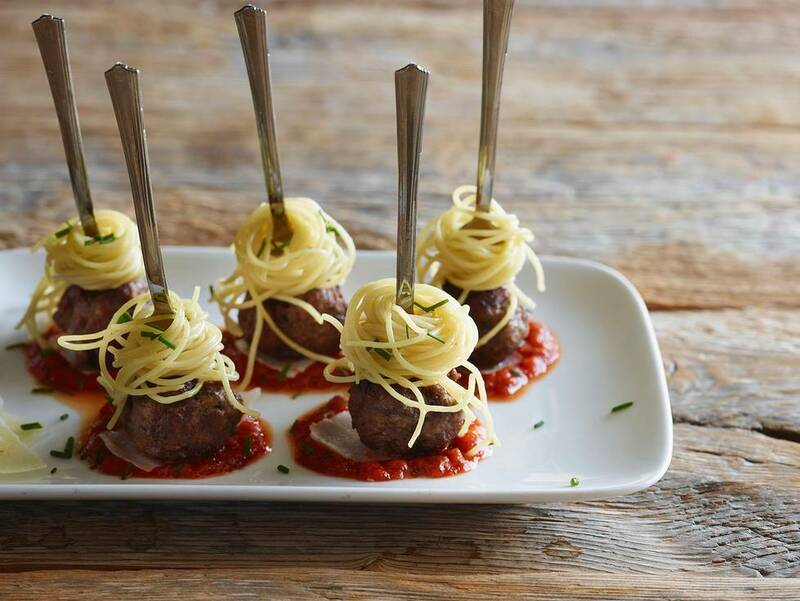 Prepare your cooked pasta by nesting it around your appetizer forks and poking the end into a meatball to cap off. Place on a bed of your marinara sauce and serve!